Thanksgiving Day is an important festival for family reunion. On this special occasion, you can express your gratitude to the persons who are important in your life and be grateful at what you have got. At this moment, beautiful songs are perfect for creating just the right mood at the Thanksgiving Day gathering. Below are top 10 songs for 2013 Thanksgiving. Have a look and see if you can't find your favorite. Laughter is the best medicine. This great, funny holiday song will definitely make you happy. Adam Sandler co-wrote the song and first performed it on Saturday Night Live in 1992. It has since become the most popular Thanksgiving song. The lyric primarily revolves around the repetition of the word "turkey". Enjoy the song, eat some turkey, and laugh to your heart's content. This country classic was wrote and performed by American folk and country artist Mary Chapin Carpenter. It comes off of her "Come Darkness, Come Light: Twelve Songs of Christmas" album but is commonly associated with Thanksgiving holiday. The lyric expresses the gratitude in having family gather around. This song was written by Bob Thiele and George David Weiss. The founding father of American Jazz Louis Armstrong recorded and released the single in 1967. The poetic lyric of the song illustrates a wonderful world. This song was released as a single by the Swedish music group ABBA in 1983. It not only expresses the gratitude to the gift of music, but also thanks favorite artists on behalf of fans. This classic was written by Irving Berlin for the 1954 holiday film White Christmas. Many artists have sung the song. The best-known recording was made by Bing Crosby. Written by Dutch writer Adrianus Valerius in 1597, this hymn was originally commemorated a military victory over Spanish forces. Around 1903, this song appeared in America hymnal and began to be used to celebrate Thanksgiving Day. This song is from the second album of Natalie Merchant - Ophelia. It is commonly used to celebrate personal generosity, which hence perfect for showing gratitude to the people in your life. It is a touching and soft song by British singer and song-writer Dido, coming off of her debut studio album - No Angel in 1999. Dido's sweet singing reminds us to thank anyone who is special in our life. This song is from the debut album of American singer Kelly Clarkson. The lyric shows the gratitude to the persons who keep bringing love in our life and who stand by our side no matter what happened. Written by Henry Alford for the English harvest festivals, this hymn was originally a classic harvest song. Later, it was taken as a meaningful thanksgiving song with its related significance. The best place to find all these wonderful songs is YouTube.com. Wanna download songs from YouTube to your iPod for free? It's easy to achieve the goal. 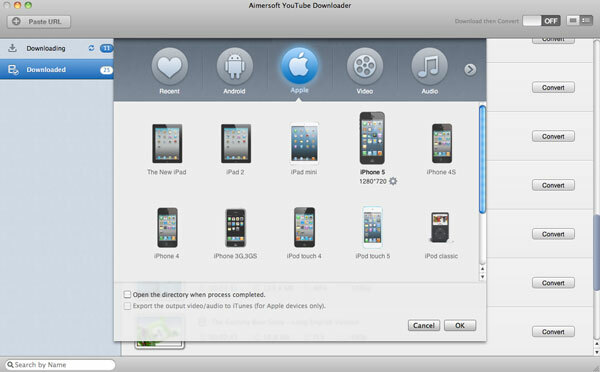 You just need to turn to Aimersoft YouTube Downloader. This smart tool lets you download any videos from YouTube just in one click. You are even able to download the entire YouTube playlist or video collections from YouTube channels. In addition to YouTube, this program also supports 1000+ other video sharing sites, enabling you to get any video you like without hassle. After your videos have been downloaded, you can convert them to any format you prefer to fit different players and devices. There are more than 100 presets provided, which include Apple products, game devices, smartphones and more. This video downloader works well with Windows 8/7/XP/Vista. 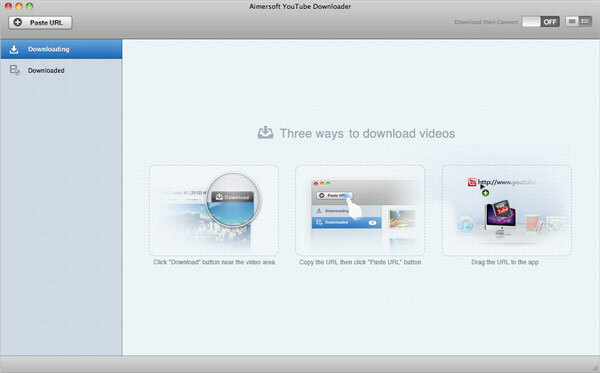 For Mac users, please turn to YouTube Downloader for Mac. Mac version is fully compatible with OS X 10.6, 10.7, 10.8 (Mountain Lion) and 10.9 (Mavericks). Why not download the free trail and give it a try. Then you can enjoy Thanksgiving songs on your iPod. The screenshots are taken from Mac version. Windows users can also follow the tips below after download and install the right version on your PC. After launching the program, you can then open the browser and go to YouTube.com. Find the music video of the song you like and play it. Note: Windows users can surf YouTube or any other sites you like via the built-in browser. When you mouse over the video, you will see a Download button appear on the top right corner of the video. Click it and then the program will start downloading the video for you. Besides, you are also able to capture the video by dragging and dropping its URL to the program. Or you can copy the video URL and resume to the program and click the Paste URL button. iPod compatible song formats include MP3, WAV etc. Then you need to convert the downloaded video to any of these formats. Under the Downloaded menu, you can access to all the downloaded files. Highlight the target video and click the Convert button next to it. Then select Apple > iPod in the pop-up window for Output format and click OK to confirm your choice. When the conversion is concluded, you can transfer the Thanksgiving songs to your iPod shuffle, nano, and classic to enjoy with the whole family.